My booklet, A Prophetic Manifesto, has been greatly blessed by the Lord. We have already printed 30,000 copies, and it looks like we will have to print more. Thanks to the generosity of our supporters, we have been able to mail out 15,000 copies to pastors all over the United States. Some of the pastors who received copies have called and ordered 50 to 100 copies to distribute to every family in their congregation. The owner of a Christian television station in El Paso, Texas was so impressed with the booklet that she called and offered to fly Dr. Reagan to her city for a live TV interview. 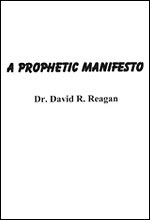 Jack Hayford, the renowned California pastor and former head of The Foursquare Churches, called one evening and left a very encouraging message, telling Dr. Reagan how impressed he was with the straightforward, simple and passionate message of the Manifesto. The Manifesto is 40 pages long. It addresses two topics: the future of our nation and the return of Jesus. It calls pastors and laymen to get serious about both subjects — to realize that our nation has assured its doom by turning its back on God and to face up to the fact that we are living in the season of the Lord's return. The Manifesto stresses the urgency of the times in which we are living. Our nation is on the brink of collapse, and Jesus is about to break from the heavens. The time is overdue for Christians to awake from their slumber and realize they are living on borrowed time. Likewise, pastors need to shift the focus from church growth schemes to preparing their people for hard times and the Lord's imminent return, calling their people to holiness and evangelism. Many have asked why the booklet has such a stark cover. The reason is that it contains a stark message that is devoid of pleasantries. There is no "tip-toeing through the tulips" to avoid hurting feelings. The message is simple, blunt, and passionate. There are many more churches we would like to send copies to. If you would like to help with that effort, designate your donation for "Mailing of the Manifesto." Meanwhile, put the Manifesto on your prayer list and pray for its widespread distribution and for the impact of its message. Article: "Likewise, pastors need to shift the focus from church growth schemes to preparing their people for hard times and the Lord's imminent return, calling their people to holiness and evangelism." To me, this is one of THE issue of our time, no, OF ALL TIME! I pray this effort by L&L can make the paragraph I referenced from the article come true. To me, this is THE most important issue of our time, no, OF ALL TIME!